Most head and neck cancers are called “squamous cell carcinomas” (SCC) because they begin on the surface layer of the region within the head or neck, where the cells are flat and squamous. Ninety percent of cases of head and neck cancer (cancer of the mouth, nasal cavity, nasopharynx, throat and associated structures) are due to squamous cell carcinoma (SCC). There are several subtypes of head and neck cancer. Dr. Dobleman is experienced in treating each variation successfully. The nasopharynx is an air passage located at the very upper part of the throat, just behind the nose. The hypopharynx is the lower part of the throat, which surrounds the larynx. This part of the body is also called the gullet. The larynx is located at the top of the windpipe, or trachea. Also called the voice box, this tube-shaped organ is involved in breathing, talking and swallowing. The salivary glands make saliva, which is essential for breaking down food. Oral cavity: A white or red patch on the gums, tongue, or lining of the mouth; a swelling of the jaw that causes dentures to fit poorly or become uncomfortable; unusual bleeding or pain in the mouth. Nasal cavity and sinuses: Sinuses that are blocked and do not clear, chronic sinus infections that do not respond to treatment with antibiotics, bleeding through the nose, frequent headaches, swelling or other trouble with the eyes, pain in the upper teeth, or problems with dentures. 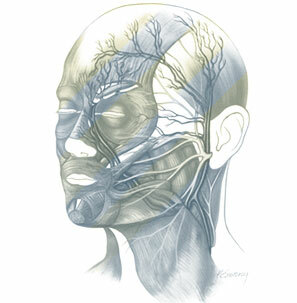 Salivary glands: Swelling under the chin or around the jawbone; numbness or paralysis of the muscles in the face; or pain that does not go away in the face, chin, or neck. Oropharynx and hypopharynx: Ear pain. Nasopharynx: Trouble breathing or speaking, frequent headaches, pain or ringing in the ears, or trouble hearing. Larynx: Pain when swallowing, or ear pain. Metastatic squamous neck cancer: Pain in the neck or throat that does not go away.